There are plenty of things for you to do while visiting Hilton Head. If you are taking a short trip via jet charter or plane and will only be in town for a few days, there are some key attractions you should see. These attractions include the Coastal Discovery Museum, Adventure Cove Family Fun Center (if the kids are in tow), the Arts Center of Coastal Carolina, one of Hilton Head’s many golf courses, and the Harbour Town Lighthouse. Hilton Head is, at its very core, a coastal town with immense natural beauty. There is no better place to witness the beauty of Hilton Head than the top of the Harbour Town Lighthouse. If you are interested in visiting the Harbour Town Lighthouse, below are some things you should know about this attraction. 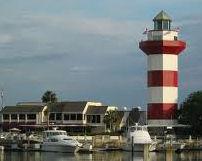 The Harbour Town Lighthouse is located within the vacation rental community of Sea Pines. If you’re staying in a Sea Pines rental property, the lighthouse is only a hop, skip, and a jump away, right off Greenwood Drive. You know you’ve found the right lighthouse as soon as you stumble upon the 90-foot, red and white tower on the edge of the harbor. The lighthouse has been open to the public since 1970, when its construction was completed, and you can visit it any day of the week between 10 a.m. and 7:30 p.m. It costs $4.50 per person to climb to the top of the lighthouse. The Harbour Town Lighthouse, which was completed in 1970, was the first privately financed lighthouse built since the early 1800s. Nicknamed “Fraser’s Folly,“ Charles Fraser, the visionary developer of The Sea Pines Resort, believed a distinctive landmark, along with a pro­fessional golf tournament, would arouse interest in the fledgling seaside community. As usual, Fraser was right, and today the candy-striped, hexagonal structure has become synonymous with Hilton Head Island. As you climb the 114 steps to the top of the lighthouse, you can stop to look at many of the historical relics and photos that line the walls. These vestiges make up what is considered the Harbour Town Lighthouse Museum. As you ascend the stairs within the lighthouse, you are actually taking a self-guided tour of the museum. Some of the relics in the Harbour Town Lighthouse Museum include photographs from the Civil War era, artifacts from as early as 3000 BC, and many other items that display the rich history of Hilton Head and the Harbour Town Lighthouse. Once you climb to the peak of the lighthouse, you’ll be amazed by the panoramic view of Hilton Head Island and its surrounding water, marsh, fairway, and harbor. After you’ve had some time to take in the beautiful view from the lighthouse’s balcony, you can head over to the “Shop at the Top,” the Harbour Town Lighthouse’s official gift shop which boasts Hilton Head’s finest collection of handcrafted crystal keepsakes. While enjoying the view, wave to family and friends via the webcam or visit harbourtownlighthouse.com to zoom in on the yacht basin, the 18th hole of the Harbour Town Golf Links or the Liberty Oak, where family favorite Gregg Russell has entertained generations of visitors for more than three decades during the summer. So, next time you’re in Hilton Head, don’t forget to stop by the Harbour Town Lighthouse!